Figure 5-9. Proteolysis during cheese ripening. The proteolytic system in lactococci starts with the hydrolysis of casein by a cell envelope-associated proteinase (PrtP). The main products are oligopeptides, which are then transported across the cell membrane by the oligopeptide transport system (Opp). Any free amino acids and di- and tripeptides in the milk are similarly transported by amino acid (AA) and di- and tripeptide transporters (DtpT, DtpP), respectively. Once inside the cell, the oligopeptides are hydrolyzed by various peptidases, including PepA, PepC, PepN, and PepX. The di- and tripeptides are also hydrolyzed. The free amino acids are then metabolized or used for protein biosynthesis (not shown). Adapted from McSweeney, 2004, and Hutkins, 2001. However, the specific casein substrates and hydrolysis products of the different PrtP enzymes can vary considerably. For example, some proteinases hydrolyze aS1-, p-, and K-caseins, whereas others have preference for p-casein and relatively little activity for aS1- and K-caseins. It should be noted that residual chymosin and milk proteinases (mainly plasmin) may also contribute to the peptide pool, especially during the early stages of cheese ripening. However, it is the starter and non-starter lactic acid bacteria that are responsible for most of the subsequent casein hydrolysis. In fact, when cheese is made with starter strains that do not produce cell wall proteinase, casein degradation occurs to a very limited extent (and cheese flavor and texture do not develop). Likewise, cheese made in the absence of non-starter lactic acid bacteria is similarly bland. cellular peptidases.The main transporter, called the oligopeptide transport system (OPP), is present in most starter lactic acid bacteria and transports oligopeptides across the cytoplasmic membrane and into the cell. Mutants defective in OPP, like mutants defective in proteinase production, grow poorly in milk because they are unable to use casein as a nitrogen source. Starter lactococci also have amino acid as well as di-and tri-peptide transport systems; however,they are somewhat less important since most of the peptides present in cheese are larger than three amino acid residues. Once inside the cells, the peptides can be hydrolyzed by a variety of peptidases, depending on their size and amino acid content. Aminopeptidases hydrolyze peptides at the amino end (i.e., the peptide bond located between the amino terminal amino acid residue and the penultimate residue), whereas car-boxypeptides act at the carboxy end. Endopep-tidases also exist that hydrolyze peptide bonds within a peptide. Lactococcal peptidases also have specificity with regard to the amino acids and their position within a given peptide bond. For example, aminopeptidase P (PepP) from L. lactis subsp. lactis hydrolyzes peptides containing proline at the penultimate residue. Protein hydrolysis also has a major impact on texture.The solubility of coagulated casein is limited, and is even less at low pH, making young cheese plastic and rubbery. However, as cheese ages and casein is degraded, the pep-tides are more soluble, and elasticity increases. Eventually, however, when the casein and casein-derived peptides are more extensively degraded, the cheese develops a crumbly, short texture. As noted above, cheese flavor and texture development is largely a function of the prote-olytic capacity of the bacteria present in the ripening cheese. However, for the most part, the starter culture bacteria are not maintained very long after the first few weeks of aging. That is not to say that their impact is not significant. In fact, as the starter bacteria lyse (due to salt, low water activity, lack of fermentable substrates, and other factors), their entire array of intracellular enzymes are released into the curd matrix. Thus, the various peptidases important for peptide degradation are free to hy-drolyze available substrates. Likewise, enzymes that act directly on amino acids, triglycerides, and other substrates are also released, as are the substrates themselves. Finally, non-starter lactic acid bacteria, as well as other indigenous bacteria, play an important (perhaps the single most important) role in cheese ripening. In particular, several Lacto-bacillus spp., including Lactobacillus casei, Lactobacillus paracasei, and Lactobacillus plantarum, increase in number (from 102 per gram to more than 107) during aging, and produce peptidases and other enzymes that generate aged cheese flavor. Of course, some of these adventitious organisms can also produce off-flavors. 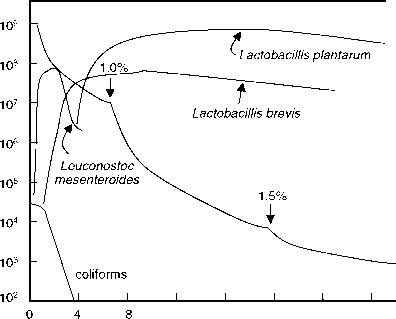 Heterofermentative lactobacilli are especially of concern due to their ability to produce acetic acid and CO2 from residual sugars.